3 Beds 4 Baths 2 Partial Baths 3,100 Sq. ft. 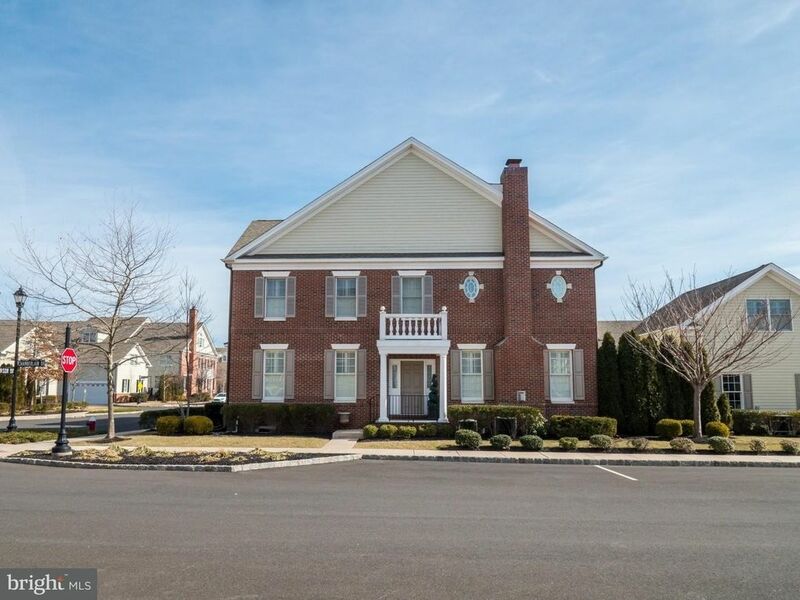 Highly sought-after Newtown Walk is a distinguished community of luxury brick townhomes that is walking distance to the quaint shops and eateries of historic Newtown, is within the nationally ranked Council Rock School District and offers quick access to Philly and Princeton. From the pillared entry step inside to gorgeous hardwood floors and a bright ambiance as this open floor plan displays fine craftsman's details including layered shadow box wainscoting, plantation style shutters adorning the windows, wide, tiered crown molding and recessed lighting. The formal entertainment areas flow effortlessly into one another as the living room enjoys an alcove and the dining room offers a spaciousness that can accommodate the largest of dinettes. The elegant d?cor and warmth of the rich hardwood floors continues into the family room where a brick lined gas fireplace is encased with an artisan mantle for a cozy appeal. Providing the chef of the home a gourmet workspace the kitchen with breakfast bar boasts gleaming granite that sharply contrasts the soft neutral toned cabinetry and stainless-steel appliances. High end appointments include a restaurant grade gas stove with grilling feature, double oven, beautiful pennant lighting, custom tile backsplashes and a pantry. An adjoining casual dining area fills with natural light and lends access to the deck and a butlers pantry complete with sink creating a perfect bar area when entertaining. The powder room, laundry and garage access are all nearby and a private Williamsburg Staircase takes you up to the bonus room. A versatile space this loft that can be an office, media space or a den if you choose. A vast owners suite enjoys a raised ceiling, has the character of the plantation shutters, and dual walk-in closets for complete wardrobe organization. With earth tones and natural light the tiled en-suite bath is highlighted by a double vanity, soaking tub and heavy glass frameless shower enclosure. Two additional bedrooms are both nicely sized, have great light, ample closet space and share the common bath with double vanity. Outdoor living will be enjoyed on a large expanded maintenance-free deck designed for privacy that enjoys the view of thoughtfully planted evergreen trees. Enjoy a built-in Bose stereo system with speakers for the deck too. Robert Ridge Park with walking paths, playgrounds and lots of open space is also just a short walk away.